Renato “Babalu” Sobral wants to win his fight with Rameau Thierry Sokoudjou and get the rest of them out of the way by next month. A little bundle of joy named Sofia is on her way. “I’m gonna take six months off,” he tells MMAWeekly.com of his soon to be born daughter. He has a non-exclusive deal with Strikeforce, who’s rumored to be holding an event in February or March, and wants to make that his last dance before attending family matters. But first is Sokoudjou, whom he faces on Saturday’s “Day of Reckoning. Training has been going well, mainly because, well, there’s been a training camp to go to. Sobral counts Josh Barnett, “Mo” Lawal, and Mark Munoz as current training partners. Esteemed striking coach Rob Kaman is also in his corner, preparing him for Sokoudjou’s explosive style. “That’s the big concern, but I train a counter for that,” he said. “But that’s definitely his main strength. If the action doesn’t go his way on his feet, Sobral is not too worried about what will transpire. Possessed with one of the best submission and ground and pound games in the business, he carries a clear advantage if the fight goes down. 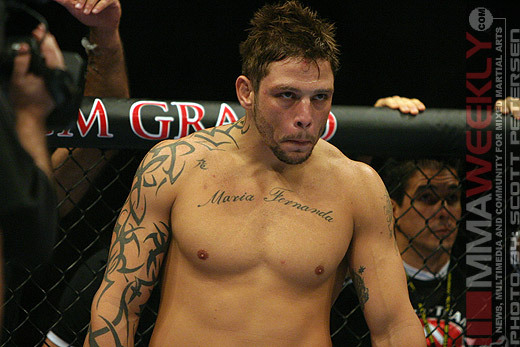 “Anything can happen in a fight, but I’m not going to give him this chance,” says Sobral. Should he be victorious against Sokoudjou, the fight is only beginning. Sleep, or lack of it, will be his next big opponent when Sofia arrives.